Sir Grout of Central New Jersey receives one of the highest levels of recognition available for customer service in the tile cleaning and hard surface restoration industry. Only about 5 percent of the hard surface restoration companies in New Jersey have performed so consistently well enough to earn our Super Service Award. Sir Grout Central New Jersey, the top hard surface restoration and tile cleaning company in Tom's River and other cities in seven surrounding counties in Central New Jersey, received the exclusive Angie's List Super Service Award for a second year in a row. The prestigious honor recognizes high achievement in customer service and customer recognition in the form of positive reviews. "Only about 5 percent of the hard surface restoration companies in New Jersey have performed so consistently well enough to earn our Super Service Award," said Angie's List Founder Angie Hicks. "It's a really high standard." It's not a simple task for members of the tile and grout cleaning industry to achieve such an impressive award. 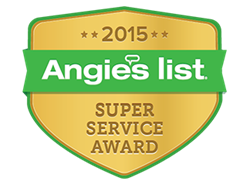 Angie's List Super Service Award 2015 winners have met strict eligibility requirements, which include an "A" rating in overall grade, recent grade, and review period grade. The company must be in good standing with Angie's List, pass a background check and abide by Angie's List operational guidelines. By winning this award, Sir Grout Central New Jersey placed in the top fifth percentile of service providing companies. Evaluation is based on the ratings, testimonials, and reviews provided by customers. The company must have a spotless record – a single bad review could easily eliminate it from the running for the Super Service Award. Repeatedly earning this achievement demonstrates that Sir Grout Central New Jersey has won the respect of their customers. Service company ratings are updated daily on Angie's List. Companies are graded on an A through F scale in areas ranging from price to professionalism to punctuality. It's clear from Sir Grout Central New Jersey's reviews on Angie's List that this company has captivated genuine appreciation from its customers for its hard surface restoration services. One example of this can be seen in the following review posted by Glennis M., a Sir Grout Central New Jersey customer who needed to have her stone honed, polished, and sealed. "[Our] technician called ahead, came on time, and was polite and knowledgeable. He cleaned and sealed my ten-year-old granite countertops and made them look shiny and new. He even buffed out scratches on my electric cook top. I would definitely use Sir Grout again." Not only has Sir Grout Central New Jersey won the Super Service Award for two consecutive years, but the company has also attained many other honors for customer recognition since its inception. Most recently, the Central New Jersey franchise was recently awarded the TrustDale Certification by investigative reporter Dale Cardwell. This award recognizes higher customer service standards, customer reviews, and a company guarantee to provide a high level of service for all clients. To contact or schedule an appointment with the hard surface restoration service at Sir Grout Central New Jersey, visit them online at http://www.SirGroutCentralNJ.com or call (732) 551-3737.